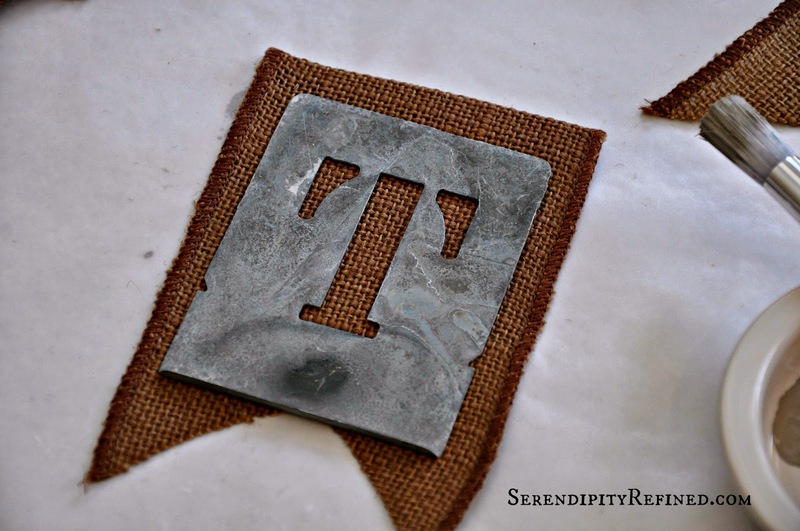 Serendipity Refined Blog: Burlap Ribbon Flag Banner and Tea Towel Apron: She Sent Me WHAT?! 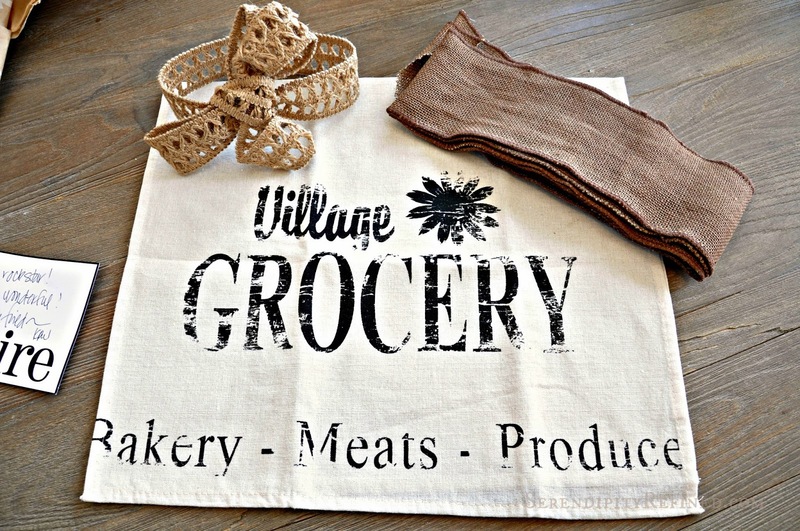 Burlap Ribbon Flag Banner and Tea Towel Apron: She Sent Me WHAT?! Ever wonder what would happen if a group of 21 home decor/DIY bloggers sent each other thrift store items in the mail and then had to find a way to use them in their homes? Imagine it, all over the US, boxes being opened and bloggers saying, "She sent me WHAT?!?!" 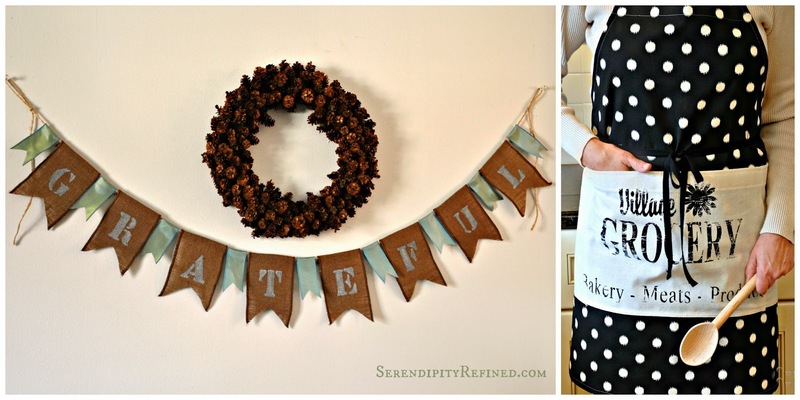 Sometimes, all it takes is little creativity to turn a yard of burlap ribbon into a Thanksgiving banner or a tea towel into an apron! 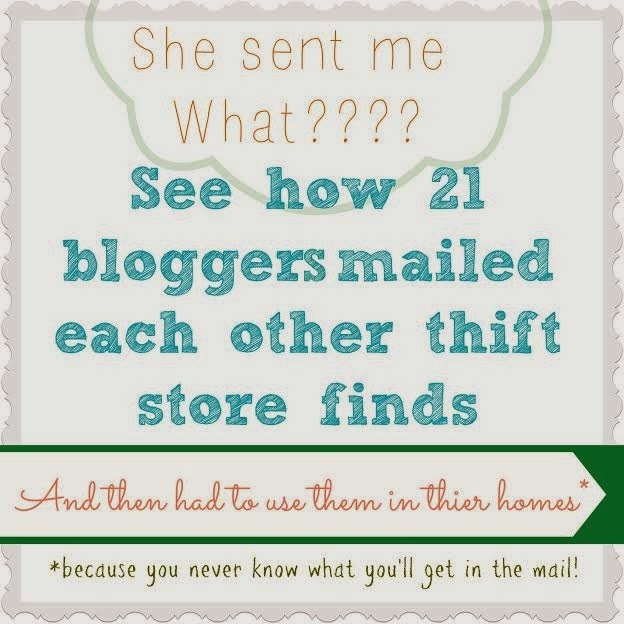 A few weeks ago, my dear friend, Jen Rizzo got 21 bloggers to accept the ultimate challenge: Agree to mail thrift store and used items to another blogger. In exchange, receive items in the mail from another blogger. The only limit: $10. 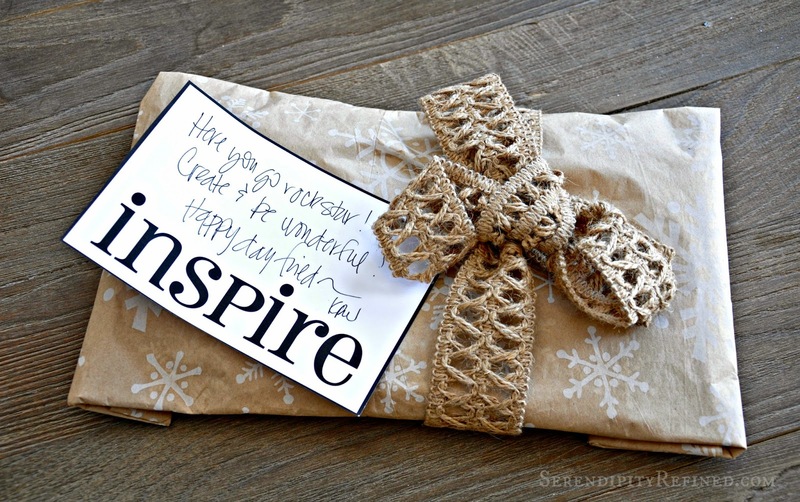 The challenge: use whatever you got in the mail in your home! If you think that I was nervous, you're right! I was incredibly LUCKY to have Karianne from Thistlewood Farms as the person from whom I received my goodies. I've known Karianne for almost two years. She was one of the first people to help me when I was starting out as a blogger and about a year ago, I actually had the pleasure of meeting her. If you haven't seen her farmhouse, the wall calender that she made out of a huge window that she found on the side of the road or her story about Lee Press On Nails, check out Thistlewood Farms...and tell her that I said "hi!" The most difficult part of this challenge was deciding what to do with the things that Karianne sent to me because there were lots of different ways to use them! For example: the cocoa colored, wire-edged burlap ribbon could have been painted a different color, made into a bow, or turned into a long strip of ribbon with words stenciled onto it but, since I loved the brown and there's a reasonable chance that I won't have time to make anything to decorate our house for Thanksgiving due to construction, I decided to use the fabulous brown burlap ribbon to make a banner. 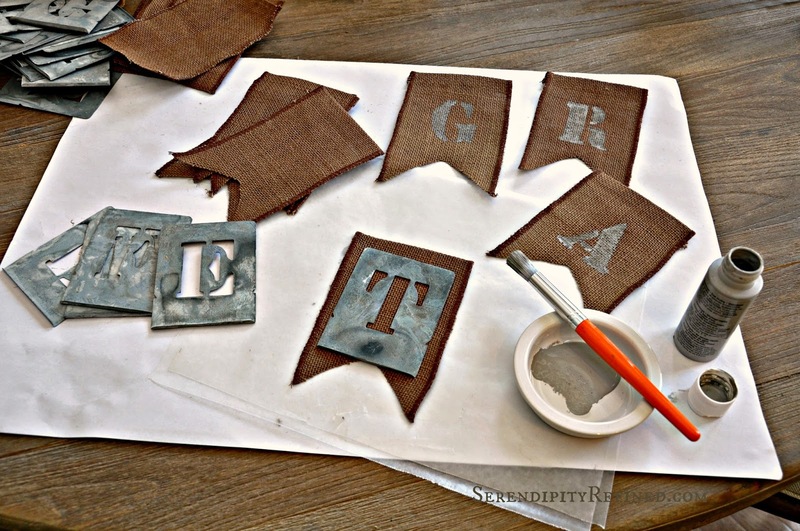 The process for making the banner was simple, cut the ribbon into 8 inch pieces, cut the ends into points and then use gray craft paint and the zinc alphabet stencils that I purchased a few months to stencil the word, GRATEFUL onto the burlap. Once the paint dried, I folded over an inch on the top, strung the letters onto a 6 foot length of jute twine and added some turquoise ribbon that had on hand between each of the letters. I used hot glue to attach the ribbon flags to the jute twine. 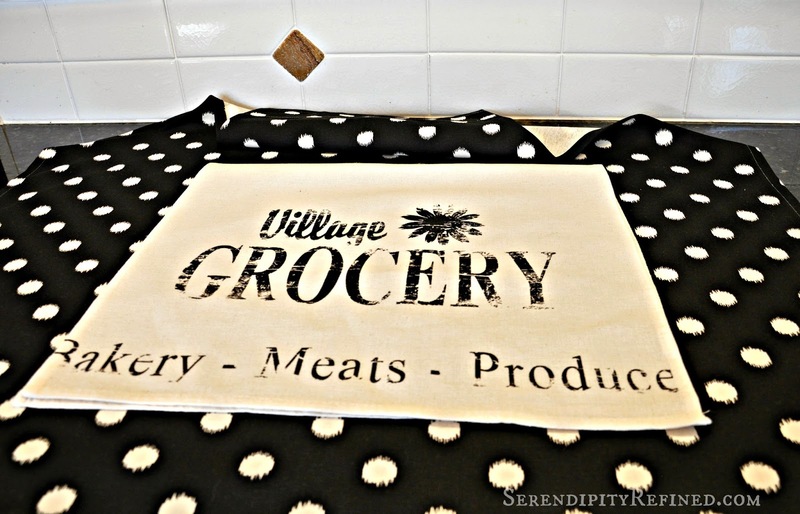 Next, I needed to find a way to use for the gorgeous stenciled tea towel. To be completely honest, I considered just using it as it was but that wasn't the goal of this challenge. I considered making it into a wall hanging, a pillow, a shade for my window or even a cute bulletin board for my grocery list....any of those things would have worked. 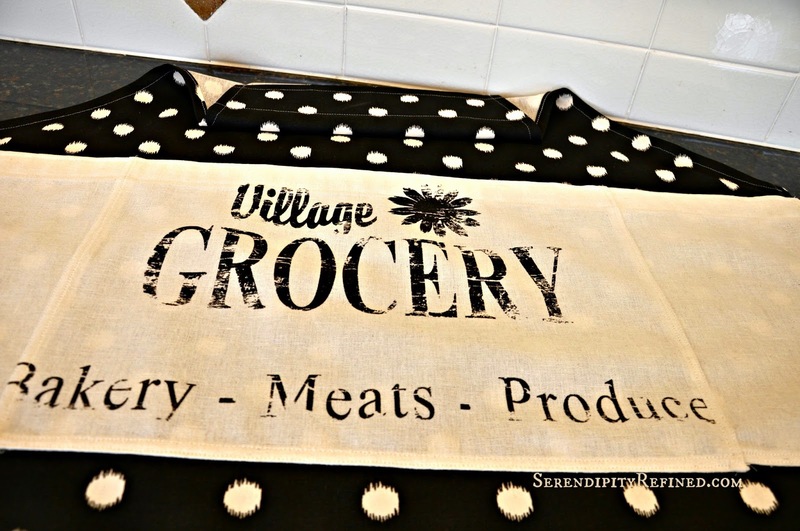 But then, one afternoon last week, it got above 50 degrees in the Chicago 'burbs for the first time since 2013 and I realized that it's almost grilling time and my apron is looking pretty tired so I decided to make the cute tea towel into an apron. There's a really easy pattern on the Internet where I would have simply cut arm holes on the top sides of the towel and added apron strings to the sides and neck. That would have been adorable, but I'm messier than that... A. LOT. MESSIER! 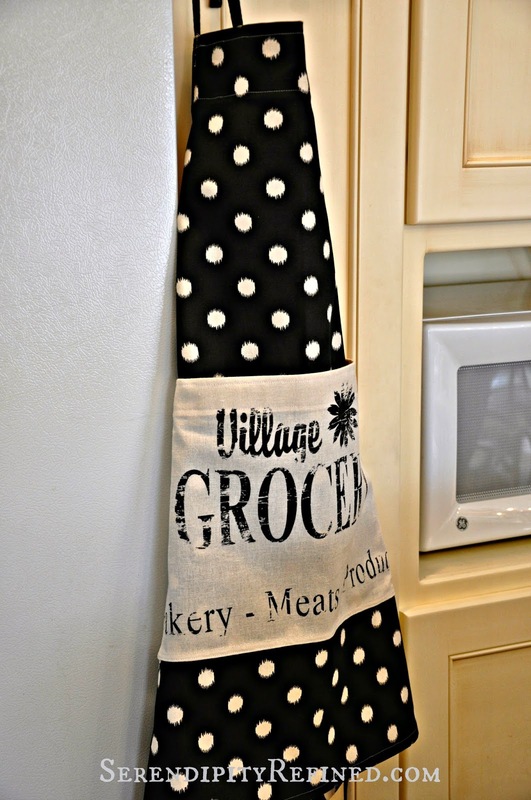 Using cotton duck cloth from Hobby Lobby and my existing apron for a pattern, I made an apron. Then, I cut the tea towel in half and the "plain" half in half again. I sewed the pieces together so that they were the width of my apron and hemmed the top with a wide hem. Then, I sewed the bottom, sides and seams to the apron to form a pocket. I added woven cotton strings to the waste and neck and, Voila! I'm going to look pretty sassy if summer ever gets here when summer grilling season arrives! The person that I sent to was Heather from At the Picket Fence. I found what I sent her at Goodwill. I boxed them up with a note saying, "Heather, I hope that these aren't so awful that we can't be friends any more!" Yep, they were bad.... but this girl can make a pizza tray and a pie plate from the Dollar Store into a three tier stand for Valentine's day so I knew that she could handle it! Heather recently moved to a new house and has already begun to turn it into a lovely home so I hoped that she'd find a way to use what I sent her...after she fixed them up a little A LOT! 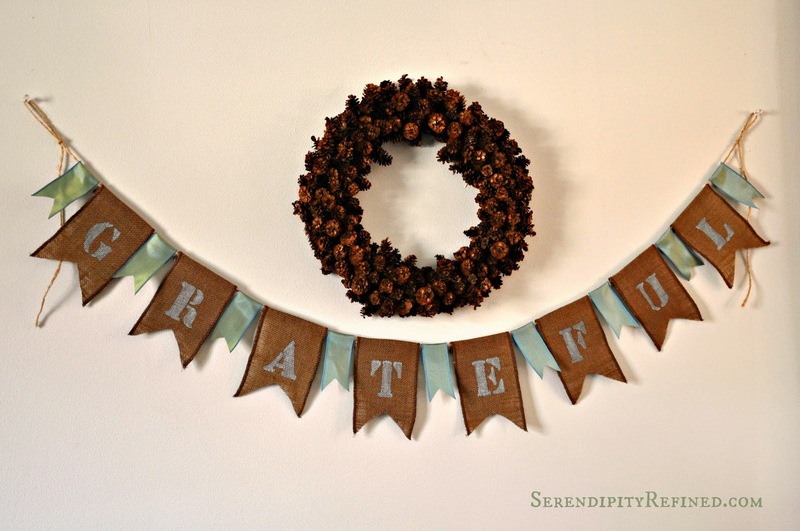 If you'd like to see what I sent and what she did with them, head on over to At The Picket Fence and check it out! In the mean time, I'm wearing my cute tea towel apron to bake a few cupcakes for my sons as they finish their final weeks of college and my burlap Thanksgiving flag banner has been safely tucked away in the drawer of the sideboard in the dining room where I should be able to find it in November!